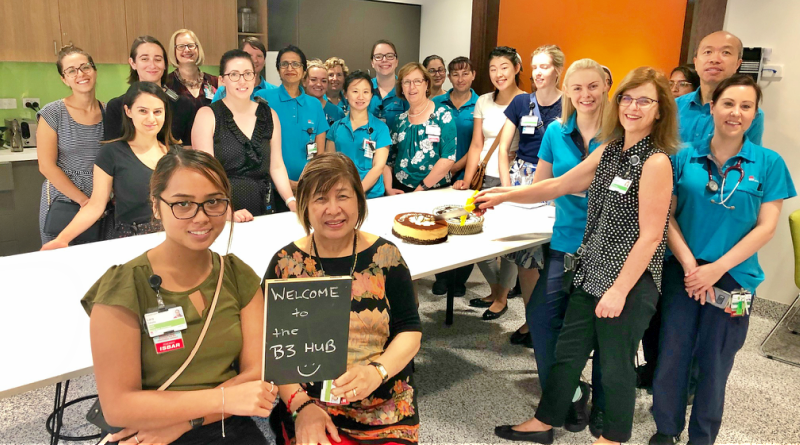 The new B3Hub at Blacktown Hospital is a hive of activity for allied health staff from social work, speech pathology, occupational therapy, physiotherapy, and nutrition and dietetics. A contemporary new purpose-built workspace called the B3Hub has been created at Blacktown Hospital for staff and students as part of the major expansion of the hospital. “It’s been a fantastic day. I think everyone is feeling really excited and happy,” Helen Brake acting head of speech pathology said. “The move’s gone very, very smoothly and everyone is so excited to be in this fantastic new space. Helen was one of about 60 staff to arrive for work in the B3Hub this morning after a year of preparation and planning. The unit includes space for quiet uninterrupted work, group meetings, and active workzone, small group work settings called chat booths, a studio for larger meetings and training, a student room, and staff amenities including a kitchen/diner and personal lockers. Helen’s first choice this morning was a stand-up desk. “I used one of the stand-up desks and it was very exciting, then I used a do not disturb room and a chat booth for our departmental meeting. It felt like a very collaborative space and there was enough privacy for us to discuss our work for the day. “What I like best is the collaboration. Everyone is together and we can see how it’s going to work for the benefit of the whole service,” Helen said. Occupational therapy head Julianne Gibbons also moved into the B3Hub with her team, acknowledging that she initially thought the paper-independent environment would be a challenge for someone who has worked with paper her whole career. Julianne Gibbons, Natalie Francis, Yogi Moodley and Amanda Nowak from occupational therapy in the new B3Hub. Occupational therapy were first to use studio this morning – the open meeting space for presentations and collaborative work. “We used the studio this morning so we could allocate tasks and share spreadsheets. “I actually quite like the studio. I’d be very happy to sit there and work!” Julianne said. “I also liked working in the quiet zone because people couldn’t interrupt me, but I wouldn’t want to do that all the time. I like it because you can actually get some work done which is a lot better than what we had downstairs. “I’m really pleased with the way things are going so far,” Julianne said. More hubs due to open mid 2019 for Emergency, Intensive Care, Women’s and Children’s Health, Peri-Operative and Gastroenterology, with each space purpose-built to suit the needs of the clinical staff in those areas.